Pass out the party hats and dish out the cake and ice cream, this is the one hundredth review here on Spontaneous Lunacy. Considering we have a few hundred thousand reviews still to come (at least!) in our stroll through all of rock history this isn’t as big of a deal as it seems at first glance and so if the focus of the hundredth review is a little underwhelming, that alright too. But since this is about the records themselves not a celebration of the website attempting to expose them all again (gifts ARE more than welcome however if anybody insists on showing their appreciation!) we shouldn’t waste too much time on any self-congratulatory hype. Therefore let’s start out by saying that the song in question for this review had only finally been released nearly a year after it was cut, so as could probably be expected this is a little bit behind the curve stylistically but nevertheless is still a reasonably engaging showcase for one of the more underrated artists in rock history. But to be truthful any opportunity to listen to Cousin Joe sing is never going to be completely wasted, so if all this does is allow us another chance to discuss his unique charm and in the process possibly spread the word about one of the more delightful all-around characters of his era then that’s reason enough to celebrate, milestone review or not. As touched upon when first we met him, Cousin Joe was the rather unusual professional moniker of Pleasant Joseph (his given name), a multi-talented singer/pianist/guitarist/raconteur whose career on wax paled next to his career on stage which took him around the world and back again numerous times, even though he remained a New Orleans fixture for years during what was undoubtedly his “prime”. That his recorded output was relatively spotty wasn’t that unusual considering where he was from as the Crescent City is really unlike any other place on earth. It’s not just a city unto itself, it’s almost another universe. Not physically, but culturally. Scores of artists were absolutely huge in New Orleans and barely known elsewhere, not because they weren’t talented enough, appealing enough or even commercial enough to be appreciated outside the their hometown, but rather because they saw no reason to ever leave the city limits. There was simply no need to. There was always more than enough clubs to play for good money and more than enough enthusiastic patrons to keep you a genuine star for years, even as the music world around Louisiana changed tastes every few minutes. Whereas for the outer world your ability to draw crowds was largely dependent on your latest record’s sales, in New Orleans your name and reputation alone could keep you steadily employed for a lifetime. For many a New Orleans-based artist who did cut records they were merely a form of business card to publicize their appearances, but once they’d established a home base from which to play, often six nights a week for years on end at the same joint, they would become entrenched as local legends drawing customers from all over the city to hear them. What need was there for them to put their songs down on wax and go on arduous nationwide tours, particularly in the segregated south in the 40’s and 50’s, getting ripped off by promoters, then either dealing with trying to keep a band together, or hoping that the assigned local backing musicians each night could credibly play your music. In a few years time when package tours became more widespread you may simply be sharing the stage with a dozen or so equally billed co-stars, each one getting a short set of 2-5 songs before the headliner came on to the close the show with a slightly expanded playlist. Hell, most of the ones who stayed in New Orleans could actually make more money by playing more music to far more appreciative audiences and still be able to sleep in their own beds each night. As a result there’s many a great artist who’s been lost to the dusty pages of history because of their very success in their hometown. Cousin Joe did tour, or more accurately, did go out of state and have extended residencies all over, but much of that was prior to his cutting his own records. By the time he got around to getting in a studio in the mid-40’s the styles he’d started off with had given way to more raucous settings and so he seamlessly adapted his style to whatever was called for. Care to hear some jazz? Sure. Want a little blues? No problem. How about some gospel? Why not? He cut records in all of those styles quite credibly. Starting in the late 1940’s you now want him to try rock ‘n’ roll? He’d be glad to. Right off the bat he delivered one of rock’s most furious ditties just as the music was getting its footing with the exhilarating Boxcar Shorty (And Peter Blue). Here he gets another record tossed into a sea of commercial indifference by a rather small label he cut just one session for, but it seemed to matter not to Cousin Joe. By now he’d settled into a life as a star attraction in New Orleans and would, more or less, stay there for years until coaxed overseas in the 1960’s when he finally began touring the world incessantly, as if making up for lost time. What he sadly couldn’t make up for during those “lost” years spent as a club act were the recording sessions he might’ve had if he’d taken a different approach to his career. So if for no other reason than to hear him sing at his peak then Come Down Baby is entirely welcome on the scene, even if it’s not his best work. This was cut just a few weeks prior to “Boxcar Shorty”, yet it sounds much earlier than that. Whereas “Boxcar” tore up the tracks, propelled by Sammy Price’s barrelhouse piano and Joe’s pouring on the coal as the engineer, this is more restrained. That’s not altogether surprising considering he’s backed by Dickie Wells Blue Seven, more of a jazz outfit (though bassist Lloyd Trotman would go on to record some indelible rock sides, most prominently the signature bass-line on Ben E. King’s “Stand By Me”). Wells group had a brass section that was typical of for the times – trumpet, trombone and alto sax – and therein lies problem number one with the arrangement. It’s not that they can’t play technically, it’s that they are TOO technical, too prim, their style of playing is lacking guts, the kind of which the more back alley tenor sax soon brought to the forefront. But in spite of this drawback Cousin Joe himself is still a treasure to behold, his vocal charm evident in each word he sings in his familiar earthy, slightly coarse, metallic sounding delivery, as if his vocal chords were made of copper pipe. Joe’s utter conviction in the story he was telling was always his strongest trait, as he has the unique ability to get you to believe that the tale he spins was not only authentic but that he was telling it for the first time as you listen, hitting every inflection just right to reveal the emotions of each character within. He was a master actor, warm and engaging, yet also capable of considerable vocal grittiness as he spits out lines like “They say you’re too far gone but that’s NOT TRUE!”, his passion digging deeper as he goes along. That’s why it’s too bad that the band’s just not up to matching him. They don’t get in the way exactly, as often was the case in rock’s first year or two as we’ve seen with far too many artists, but they don’t add anything either, they seem to be playing for a different audience in a different setting and when the instrumental passages come along your mind wanders, which is the death knell for scoring a hit of some kind. When Joe comes back it’s like the sun coming out after the rain but the ground beneath his feet is still wet from the brief shower. As a result the record is like a book left out in that rain, there may be enough be pages that don’t stick together to get through it, but you wouldn’t want to read the entire soggy thing this way. It doesn’t help that the storyline is rather simplistic, allowing for some decent lines along the way, but no real twists in the plot for Joe to spring on us (and maybe not surprisingly it’s one of the few songs he wasn’t credited with writing). It’s fairly stereotypical as well, just a series of not-too-severe put-downs of a girl who’s drawn Joe’s mild ire, apparently for her getting high (booze, drugs, he doesn’t say). He’s not altogether mad at her, seeming to be more annoyed at her erratic and flighty behavior than anything, though because he doesn’t delve into any details we’re left to guess as to the reasons that led up to this harangue. You could only half pay attention and miss the self-medication angle entirely and just take it as him getting frustrated with her not paying him enough attention in the love and tenderness department and the song really wouldn’t be affected much by the change, and that’s never a good thing, especially coming from someone whose storytelling skills are such a big part of his appeal. Joe was arguably the most charismatic of rock’s early vocalists and that this works as well as it does is testament to his natural charms and the urgency in the way he delivers it, but there’s only so much he’s capable of when faced with a rather vague storyline and slightly out of date accompaniment. As a result this is a record you’re best hearing in a mix while doing other things where its drawbacks won’t be as noticeable. It’s not going to stand out for good or for bad though either way, I suppose you won’t really mind what you hear if you listen more closely but I doubt you’d mind if you missed most of it altogether if you got caught up in conversation or stepped out of the room for more drinks. Not high praise for sure, but I hope it’s clear that it’s not an outright panning either. Come Down Baby is serviceable at the very least but it’s hardly anything that’s going to position him as a leader of rock music as it advances, which is probably the most unfortunate aspect of its shortcomings because rock needed artists like this adding to its overall textures. In an alternate universe Cousin Joe would’ve been an enduring critically acclaimed cult-figure lurking in the shadowy fringes of rock, like Tom Waits down the road, someone who acted as the witty conscience to the music’s more mainstream offerings. The odd footnote to all of this was the record would actually get re-released a year later, in July 1949 on another label, when it would be well past its expiration date and had virtually no chance of making any impact on rock’s evolving style, nor doing anything to salvage Joe’s gradually diminishing recording prospects. By then I’m sure Cousin Joe couldn’t have cared less. Wherever he was playing then the doors open each night at eight, he’ll be on until closing, drinks will be flowing and the floor will be filled with eager patrons, none of whom will have a pocketful of nickels to put in a jukebox to spin any records and turn into a hit. Instead they’ll be grinding to the real deal, live and in person, digging an artist who was a consummate showman and a nonpareil bandstand ruler and it’s a sure bet that he’ll leave them with no regrets when the show’s over, because that’s what they do down in New Orleans every night… records be damned. 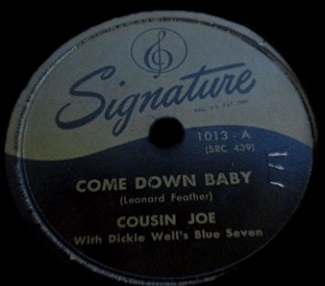 Leave a reply on "Cousin Joe: “Come Down Baby”"